We don't just build some of the world's best flashlight products---we also build the world's best off-road LED lighting system. Check them out at www.mtnlitebar.com! 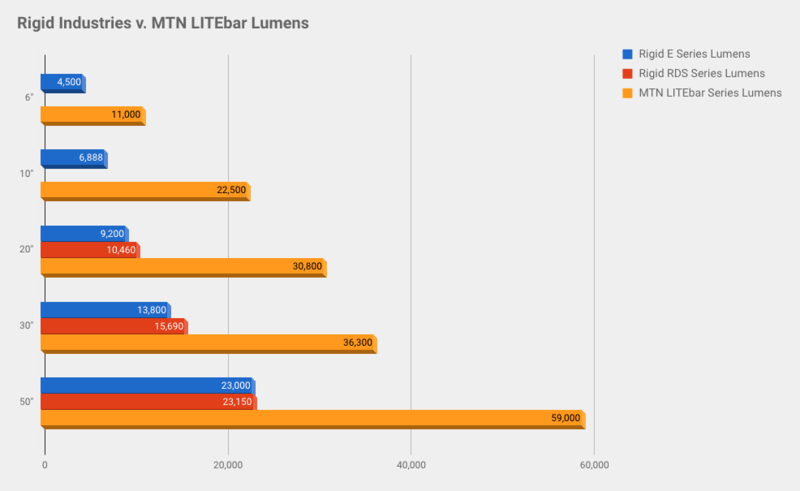 Why is the MTN LITEbar system the best? An innovative, Patent Pending power control system gives the LITEbars more power than competing bars that are two or three times their size! In the same size and form factor nothing gives you more output than the MTN LITEbar system. What most typical light bars lack is spot intensity---they light up everything up close, but don't reach down range far enough to enable true high speed driving. The double row LITEbars have a spot intensity that is often several times more intense than similar competing bars. The increased throw will allow many racers to replace their power hungry and fragile HID lights with a single or combination LITEbar. The LITEbars use daylight neutral white high color rendition LEDs, which provide a more natural, even light, with reduced glare when compared to cooler, lower color rendition LEDs. They show rich, natural colors, which enhances depth perception and terrain identification. Mode levels greatly enhance versatility. Stopped or going slow and don't need full power? No problem! Just switch to a lower mode. Passing someone on the trail? No problem! Just switch to a lower mode. The ability to switch mode levels on the fly allows you to use the LITEbar in more situations than a bar with only one mode. The LITEbar allows you to choose between 1, 2, or 3 modes without having to remove the light or change any dip switches or jumpers. There is also a “hidden” indicator light mode. Need light without running your engine or while winching? You can decrease the current load significantly by lowering the output level. Solid state switching means that there are no mechanical relays to fail or stick. This also provides us with the ability to protect the battery and charging system by decreasing output on low voltage, then shutting off the light automatically before your battery is all the way dead. 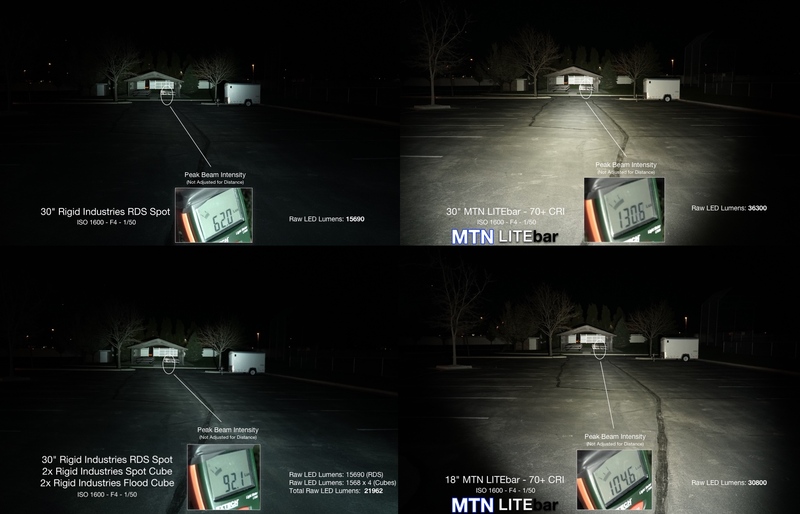 ​Dollar-for-dollar, you get more lumens, and more overall value with the MTN LITEbar system. Each MTN LITEbar system comes with everything you need to make it run, including battery cables, switches, etc., so you don't need to search for the proper parts or struggle with complex wiring diagrams---we've already done the work for you. Just plug and play! The MTN LITEbar system has tons of real-world use under its belt. We've logged thousands of cumulative hours of grueling use, gaining invaluable experience and feedback from our users along the way. Every LITEbar product we sell has been tested extensively before being released. All of the electronics are fully potted for vibration and moisture resistance. Each MTN LITEbar system is water tested, thermally tested, and output tested. Not only is the MTN LITEbar system covered by a warranty, we can provide excellent support as well. Since we design, use, and manufacture the product ourselves, we are able to provide superior customer support.